Gardening on a budget doesn’t mean you have to put up with a boring backyard. 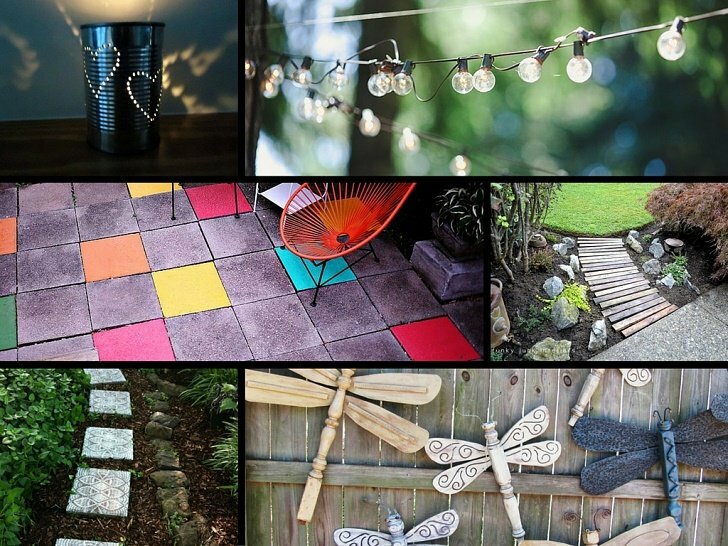 When it comes to brightening up outdoor spaces, a little can go a long way. Whether you’d like an outdoor bar for under $20, or a flower chandelier for free, it can be done! Here are 32 fantastically frugal ways to beautify your garden. Don’t spend time and effort removing an old tree stump from the garden! Just add a wooden or glass top and turn it into a useful little table for enjoying a morning coffee, sunset cocktail or weekend brunch. An old car tire and some spray paint can instantly brighten up the garden. Spray the rubber with your choice of paint, hang it on a tree or wall, and fill it with colorful flowers and trailing vines. Add a whimsical feel to the garden with these sweet DIY cement mushrooms. Kids will love them, and they make perfect gifts for guests to take home from your next outdoor party or barbecue. For privacy and security that doesn’t cost an arm and a leg, why not build your own rustic pallet fence? With a coat of paint, and some added plants, no one will ever know it was a DIY job. For a small investment, outdoor string lighting can be used in a multitude of ways to upgrade your garden. Illuminate pathways, light up the porch, add an intimate feel to al fresco dining, or jazz up plain fencing. Fountains bring soothing sounds and mesmerizing movement to a garden. Although a full-size fountain may be out of your price-range, there’s nothing stopping you building your own small-scale version. This one simply requires a pump, tubing, gravel and two waterproof pots. Not only are homemade feeders beautiful in their own right, they attract gorgeous colorful butterflies to the garden, who help pollinate and spread your bright blooms – providing three benefits in one! Best of all, many can be made from household items like plates, pots and jars. Build a natural looking raised garden bed using only small branches, a few logs and some straight timber beams – the perfect project to carry out after a garden clear-out. Ideal for bird lovers, this hanging bird bath is simple to make, using just a grapevine wreath and terracotta plant saucer. It provides a spot for the birds to take a summer dip while adding to the charm of the garden. Provide a flower filled welcome to your garden by hanging colorful wellington boot planters on the gate or fence. This is also an ideal way to upcycle old boots that the children have outgrown. Plain concrete stepping stones look pretty drab. This fun project sees them spray painted with a lace pattern, using just an unwanted vinyl doily. 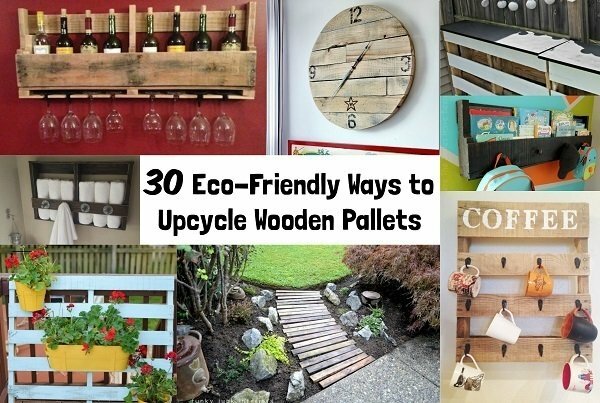 You’ll also need spray paint, sealer, and some old stone slabs. Create the illusion of a larger space and more greenery with a few strategically placed mirrors in the garden. Depending on the size of the mirror, it can resemble a window-like portal or a doorway to another world! Small concrete yards or patios always benefit from more greenery – but that’s not always within the budget. By simply adding a faux grass rug and some potted plants, you can transform a barren outdoor space into a pleasant, cozy and inviting area for all the family. Possibly one of the easiest beautifying ideas on the list, this outdoor art idea is ingenious. Adorn your plain, wooden fences with glass marbles for a fun project that adds a pop of color and light to the garden, especially when the sun hits it from the back. Simply drill holes and fill with a marble – no adhesive required! No matter how good your garden looks, if your outdoor furniture is past its prime, it will let the whole space down. Luckily, providing a new lease of life to tables and chairs is quick and cheap. Old plastics can be cleaned and sprayed with paint, while wooden items may require a light sanding first. Plants can thrive in a variety of containers – many of which serve as focal points for the whole garden. Just about any old household item can be turned into a beautiful free planter – from old colanders and teapots to toy trucks and broken musical instruments. When you’re watching what you spend, an outdoor bar may seem out of the question. However, this charming one – made with wooden pallets, screws, boards and paint – costs under $20 and can be constructed in an afternoon! Transform boring old soup tins into beautiful tea-light holders using just a hammer and nail. These easy lanterns add mood lighting to your backyard or patio, and are perfect for long summer evenings outdoors. This fun chandelier – filled with flowers rather than lights – is a fantastic way to bring color and charm to a garden party or barbecue without spending a dime. All you need are jars, string and a wire basket. Put your broken garden pots to good use and create a delightful and whimsical fairy garden, filled with flowers, succulents, moss and tiny fairy towns. Requiring both creativity and imagination, this is a fantastic project to keep kids entertained. For a charming garden feature for free, consider making this wooden walkway. It enhances any backyard and links up different areas of the garden for a more cohesive feel. Just cut pallet boards down to size and arrange them to form a pathway. For easier weeding, leave the boards loosely secured by soil. Relax on a suspended pallet bed throughout those lazy summer days. Using just a pallet and rope, and adorned with cushions and blankets, this project can be as elaborate or as simple as you wish. Don’t forget to reward your hard work – and test your new creation – with an afternoon siesta under the sun! Chipped plates can be repurposed to bring Mediterranean flair to your garden. Simply smash the plates into smaller pieces (using safety goggles and heavy fabric), and secure them with adhesive onto an old tabletop. Grout, seal and admire your new piece of garden furniture. One of the easiest ways to beautify on a budget is to add a lick of paint to grubby grey outdoor tiles. Choose colors that fit in with your garden scheme, or go for completely contrasting tones. Build a cute minimalist garden shed from discarded doors and windows (keep an eye out for renovations in your neighborhood). By downsizing your storage space, you’ll maximize the space available for planting and relaxation. It’s also a great opportunity to clear out all your old garden junk! Transform mason jars into island-themed party decorations with this different take on the traditional bamboo Tiki torch. These are so simple to make, yet they look absolutely fantastic. While you may want to spend every waking moment in your beautiful thrifty garden, the chilly evenings can force you indoors. Why not combat the cold and elevate your outdoor dining experience with your very own DIY fire pit? This one can be built for just $25! Cute dragonfly ornaments – fashioned from table legs and old ceiling fan blades – can be attached to fencing, sheds, tables and chairs, and any other garden surface you desire. Add instant color to the garden – even in winter – with beautifully decorated flower pots. Buying them new can cost a small fortune, but luckily there are plenty of tips and tricks to revamp plain, old containers. You can paint them, dip-dye them, stencil them, monogram them, stamp them, print them, bejewel them and so much more! Collect all the colorful glass bottles from your next party or holiday event and put them to good use in the garden. 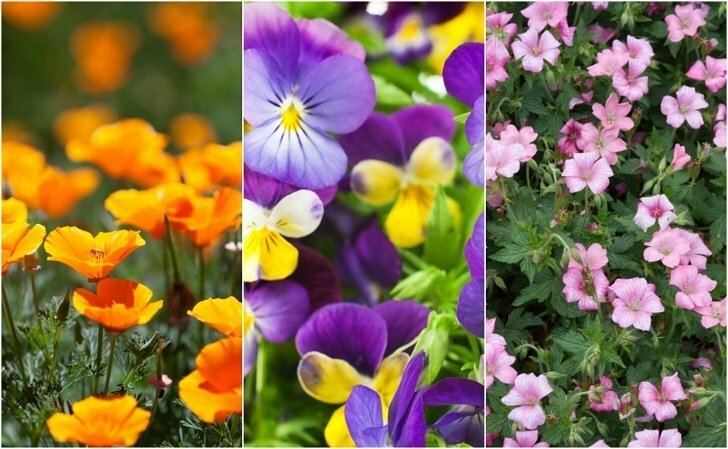 Create a beautiful flower bed border that’s both thrifty and sturdy by burying the tops and leaving the colorful ends exposed. If you’re running out of space to plant your herb garden, go vertical! A cheap fabric shoe caddy is all you need. Hang it from your fence or porch and plant as normal. Some cute tags, made from fabric scraps, complete the look. Use your mismatched tea cups, or vintage thrift store buys, to create a stunning yet functional bird feeder on a budget. Just make sure you position the feeder out of the reach of neighborhood cats and other predators!